FEATURED EXHIBIT/ - Amazing Adaptations Exhibit Opens! Description: Be among the first to see a NEW gallery featuring seahorses, seadragons and pipefishes and learn about their incredible adaptations. Keiki crafts that give more insight in to these amazing creatures will be available from 9AM - 1PM ! Learn what makes the Aquarium run, from fish food to quarantine, and many stops in between. Climb-up and peer into the backs of the exhibits and see how exhibits are created. Visit the coral farm where and the Jelly Hale, where sea jellies are raised. The program will end with participants feeding the animals in the Edge of the Reef exhibit. Minimum age 7 years; youngsters must be accompanied by an adult. Accessibility is limited. Groups of ten or less are welcome. $12/adult, $8/child ($15/$10 for non-members). Aquarium Biologists teach are all specialists. Learn about their jobs, raising jellyfish, cultivating plankton, feeding seahorses, or growing and shipping coral. Different presentations every week. Learn about the Hawaiians relationship with the sea. See displays of tools used by the Hawaiians for fishing and the natural materials they were made from. Search for night‐active crabs, lobsters, eels and octopuses. Look for sleeping parrotfishes, triggerfishes and day octopus in their dens. For the adventurous, ages 6 years and up; youngsters must be accompanied by an adult. Participants should be comfortable in the ocean, both day and night. $20/ adult, $15/child and $15/$10 for members. Discover if fish sleep on an after-dark flashlight tour of the Aquarium. Find the sleeping spot for the red-toothed triggerfish or the rock-mover wrasse. Are yellow tang always yellow? Come for a class followed by a tour of the exhibits. Minimum age 5 years: youngsters must be accompanied by an adult. $10/adult, $7/child ($14/10 for non-members). Pre-registration required. Search for night-active crabs, lobsters, eels and octopuses. Look for sleeping parrotfishes, triggerfishes and day octopus in their dens. For the adventurous, ages 6 years and up; youngsters must be accompanied by an adult. Participants should be comfortable in the ocean, both day and night. $20/ adult, $15/child and $15/$10 for members. Sneak-a-peek behind the scenes, and learn about Hawaiian reef animals. Hold a sea star, feel a sea cucumber and feed an anemone. This half-hour program is a great addition to any visit to Waikiki Aquarium. Perfect for families with children 4 and up. $5/person plus Aquarium Admission. Sharks, turtles, and seals are just some of the animals that will be highlighted in these classes for kids. Keiki will learn about sea creatures through crafts, singing, storytelling, dance and play. Designed for kids 1 to 4 years-old. $10/person, $6/member. More sightings of seals around the main Hawaiian Islands have renewed interest in these amazing and endangered animals. Learn about seals in the wild: What do they eat? How deep do they dive while hunting? Do they really have fingernails? Then move to the monk seal habitat where Aquarium Biologists will introduce you to the resident seals, Makaonaona and Ho'ailona. Participants will assist with seal enrichment activities. Designed for participants 6 and up, but anyone interested is invited to attend. Groups of 15 or less are welcome. $7/person ($10/person for non-members). Looking for something to do after school? Every Wednesday, the Aquarium hosts an interactive learning activity near the Monk Seal Deck. Join us for a critter encounter or a marine science craft designed for families. Free with admission to the Aquarium. What animals are the most interesting to guests? Learn a little about the longest lived giant clam in captivity, those weird and wonderful seahorses, the most endangered seal in the world, and fish unique to Waikīkī Aquarium. Drop in for this short presentation at one on Mondays and Wednesdays. Free with admission to the Aquarium. Every Tuesday, at 1:00 p.m. Founded in 1904 and administered by the University of Hawai'i at Manoa since 1919, the Waikiki Aquarium is located on the shoreline of Waikiki Beach next to a living reef and across from Kapiolani Park. The Aquarium -- second oldest in the U.S. -- showcases more than 500 marine species, and maintains more than 3,500 marine specimens. Public exhibits, education programs and research focus on the unique aquatic life of Hawai'i and the tropical Pacific. The Aquarium welcomes more than 320,000 visitors annually, and is open daily from 9 a.m. to 4:30 p.m. except Honolulu Marathon Sunday and Christmas Day. 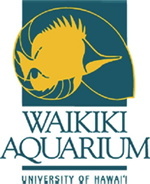 Admission is $12 for visitors; $8 for local residents and active duty military with ID, $5 for senior citizens and juniors ages four to 12; and free for children three and under and Friends of Waikiki Aquarium (FOWA) members. and conservation of Pacific marine life. 500 species of aquatic animals and plants. Raina Fujitani at (808) 440-9008 for more information. opportunities to help make a difference! groups and provide outreach programs for school and community groups. up-close observations of Hawaiian marine life. Selection Shop – Assist with stocking inventory and sales. ADMISSION: $12 for visitors; $8 for local residents and active duty military with ID, $5 for senior citizens and juniors ages four to 12; and free for children three and under and Friends of Waikiki Aquarium (FOWA) members. Privacy - We value our relationship with YOU!. Your Email address is not shared with anyone except Kaimuki Hawaii.com. You will be added to the "once a month" Kaimuki, Hawaii Email newsletter to keep you current and informed. If you would like to be removed, just reply to the Email confirmation with "DISCONTINUE" in the subject line. Founded in 1904, the Waikiki Aquarium is the second oldest public aquarium in the United States. A part of the University of Hawai`i at Manoa since 1919, it is located next to a living reef on the Waikiki shoreline.